Company has arrangement for numerous free software solutions like SQL MDF Viewer software it is a shareware application that helps to access complete information of damaged, corrupted, inaccessible, MDF files even without installing SQL Server editions like 2012, 2008 r2, 2008, 2005, and 2000 onto your machines. Download SQL MDF Recovery FREE! Demo version will tell you the recovery process in a better and effective way. 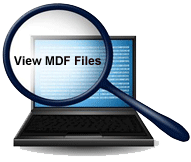 Enable View to Corrupted MDF Files SQL users can view their overall damaged stored in MDF files like tables, views, triggers, stored procedures, rules, functions, etc. Software enables SQL users to view all the contents in SQL MDF file. Workable after Any Corruption Reason After any reason of corruption, be it application failure, virus attacks, Trojan infection, hardware failure, or any other software help you to view damaged data stored in MDF files. 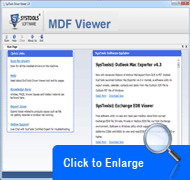 Workable with Most Windows Editions This SQL MDF Viewer is supportive to work with various MS® Windows Operating System editions like NT, XP, 2003, Vista, 7 and Win8 etc. Read Healthy MDF Files As Well You can use this SQL MDF Viewer application to view healthy .mdf files and its contents also. By downloading software free of cost of this shareware edition, you can open damaged MDF files.you can view all the contents stored in MDF files, You are not required to provide special requirement to view contents stored in MDF files. The Software is limited only till giving you complete information about damaged contents in MDF files. After availing information about damaged data, invest in SQL Recovery software from company, meant to recover corrupted data stored in MDF files. The cost of the software is nominal that help in overall data recovery process. I am the Database Administrator of my organization and after the corruption of SQL server I wanted to view my MDF files which got damaged. And with this SQL MDF viewer I successfully viewed my complete damaged files so really thanks to Developers.